Designed with high temperature resistant glass lens, isYoung car video camera can work in hot weather. 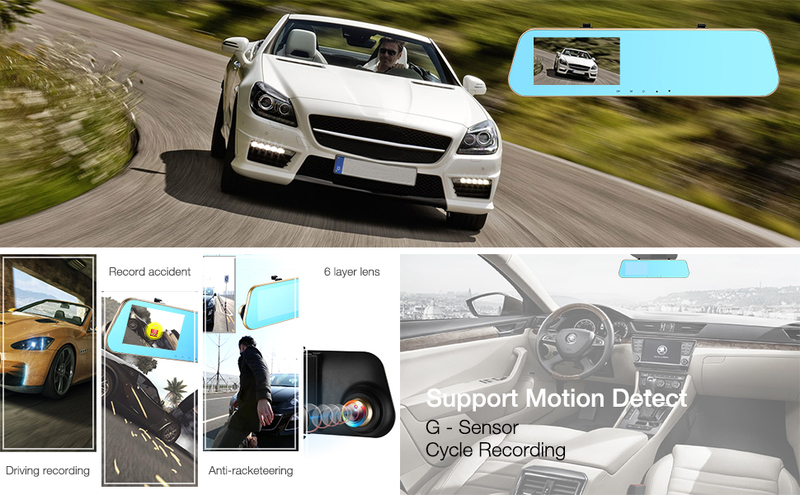 G-sensor System:When an accident occurs, the car video camera will lock and save the video. The saved video won't be covered by new videos. Multifunctional Car Camera: It features automatic recording, manual recording, shooting photos, USB connection and works as a useful reversing camera. Automatic Recording Function: The car video recorder will automatically turn itself on for recording when starting the car. Manual Recording Function:Long press the Power Button for 3 seconds, and the car camera will start to record. Photo Function: Short press the Mode Button then the car camera will enter the photo mode. G-sensor System: When an accident occurs, the car video camera will lock and save the video. Voice Function: It can record voice with the built-in microphone. Short press the Down Button, the microphone will be disabled. Press the button again, the car camera will work. Automatic Shockproof Function: It will effectively avoid fuzzy images in the camera. Parking Monitoring System: It provides a good visual reversing camera to help park your car well. Loop Video: It supports seamless loop video and motion detection: images in motion will be automatically recorded.